The challenge of the Holocaust drama isn’t conveying the importance of the subject but recognizing the necessity of encapsulating that importance in a new way. With so many movies focused on one of the great tragedies of humanity, it’s inevitable that familiarity will creep in, the chronicling of atrocities eventually becoming more numbing than shocking or illuminating. Although there are plenty of worthy Holocaust films, the solemnity of the storytelling risks becoming sanctimonious, suffocating. What new can we possibly learn about those well-documented horrors? What elevates Son of Saul is that first-time feature filmmaker Laszlo Nemes has constructed a new way of grasping the insanity and senselessness of those long-ago crimes. But what’s remarkable is that, rather than taking the obvious tack and investing his scenes with expected images of horrible suffering, he captures the terror of the concentration camps in an almost offhand way. 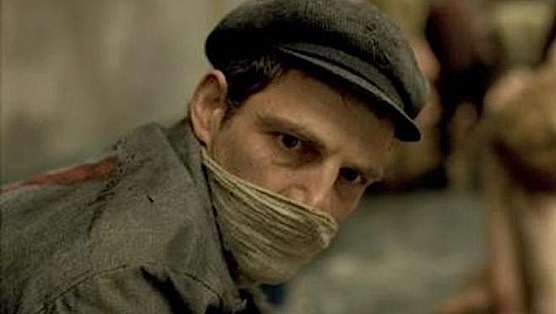 Son of Saul is rightly called a Holocaust film, but it’s not quite like one we’ve ever seen. Through some stunning technical achievements, Nemes has made a film that more closely aligns itself with the workplace drama and the intimate war movie. Saul is played by Géza Röhrig, an actor whose weary, determined eyes draw comparison to Jean-Paul Belmondo’s. A captured Jew, Saul works in the concentration camp as part of the Sonderkommando—essentially, a man forced to help facilitate the Nazis’ systematic murder of its prisoners. But in keeping with Son of Saul’s less-is-more approach, we don’t get a sense of Saul’s feelings about his difficult job. All we see are those eyes, or the back of his head as he moves from task to task. Filmed often in close-up with handheld cameras, Saul isn’t intended to be a complex character. As envisioned by Nemes, he’s merely a man trying to survive. The crushing routine of Saul’s life receives an unexpected jolt when he takes special notice of one young corpse in his care. Looking at the beatific child, Saul feels a kinship, which at first is unexplained. Finally, he reveals to a colleague that the boy is his son and that he wants to ensure he receives a proper burial. This strikes others in the camp as odd—Saul doesn’t have a son, does he?—but Son of Saul never makes it easy to know what to believe. Perhaps Saul is lying? Or maybe he’s seeing in this corpse a past his fellow prisoners know nothing about. Or, perhaps, he’s just going insane. No matter the truth, Saul begins a single-minded quest to find a rabbi in the camp and orchestrate this clandestine burial—all the while hopefully avoiding suspicion from his German captors. But Son of Saul isn’t The Great Escape or some other rousing World War II escape picture. It’s a grittier, more immediate film that strips away the solemnity of the Holocaust movie by plunging us into Saul’s moment-by-moment mission. And Nemes’ camera—the cinematography is by Mátyás Erdély—emphasizes long takes and shallow focus so that we can’t make out Saul’s harsh environment but can always sense it. We’re attached to Saul’s hip, practically hanging on for dear life. Remarkably, this intentionally myopic perspective offers a new way of seeing decades-old tragedies. Because we ride along with Saul, we’re forced to learn about the camp through his interactions with the other prisoners. And what we discover is an intricate, harsh ecosystem with its own rules and code of behavior. Certain prisoners are chronicling their traumas through secret diaries or stashed still cameras. There’s a self-policing that goes on among the prisoners so that no individual jeopardizes the group. And always, there is the casual, ever-present possibility of violence and death, the random image of naked corpses being dragged in the background. In fact, sudden death is such a common occurrence in Son of Saul that, instead of being numbing, it’s despairing. Röhrig’s performance is a tricky one. A man without a personality, Saul is a stoic figure that we never learn much about. (Amidst the terror, there’s no time for expository dialogue that lays out conveniently tidy backstories.) The problem with such a strategy is that Son of Saul can feel like it’s being guided by a cipher, more a focal point for the drama than a magnetic or compelling emotional center. Still, Röhrig’s face expresses sorrow and buried hope that sufficiently keeps us invested in his journey, even if we’re never sure whether he’s lost his mind or somehow reconnected with a mysteriously absent son. However, the true star of Son of Saul is its technical achievement, which is considerable. It’s not simply that Nemes utilizes bravura long takes that are extensively choreographed but utterly naturalistic—it’s that the technique accentuates the immediacy (and, hence, the horror) of the concentration camps. (Every once in a while, Son of Saul almost feels like it’s playing out in real time, with extended sequences drawing suspense from their roughshod urgency.) We’re not shown a world; we’re immersed in it—forced to get our bearings as quickly as possible because the characters aren’t going to waste their breath explaining it to us. Like many fine Holocaust dramas, Son of Saul is so gripping and grueling that it doesn’t necessarily lend itself to multiple viewings. But the offhand complexity of the storytelling leads me to suspect that return trips to this movie will produce deeper revelations about the construction of its story. Even then, though, Son of Saul’s powerhouse finale probably won’t be any less stunning, nuanced or shattering.